Cream butter, 2/3 cup sugar, egg yolk, milk and vanilla in small mixer bowl; blend into creamed mixture. Chill dough about an hour or until firm enough to handle. Keep the egg white at room temperature until dough is ready to handle. Then beat the egg white until frothy and place in a small bowl. Roll each ball in either the granulated sugar or the ground nuts and place on a lightly greased cookie sheet. Make a thumbprint in each cookie. Place in oven preheated to 350 degrees for 10-12 minutes. Once the cookies have cooled, place a dollop of vanilla filling in the thumbprint and top with a Hershey Kiss. Heat oven to 350 degrees F. Mix thoroughly butter, shortening, sugar, egg yolk and vanilla. Work in flour and salt until dough holds together. Shape dough into 1 inch balls. Beat the egg white until foamy. Roll each ball in the egg white then roll in chopped nuts and place on lightly greased cookie sheet. Press thumb in the center of each ball and pplace in oven for 10 minutes. After cookies have cooled, place a dollop of vanilla filling (below) in the thumbprint and top with whatever turns your key—candied fruit, Hershey Kiss, Walnut or Pecan half, etc. Combine all the dry ingredients in a large mixing bowl. Add water, oil, vinegar and vanilla and beat for 3 minutes at medium speed until thoroughly blended. Pour into a greased and floued 13x9x2 inch pan. Bake at 350 degrees F for 35-40 minutes. Cool and frost as desired. Personally I like White Mountain icing but some of my family prefers peanut butter icing. I got this recipe from the Hershey’s Cocoa Cookbook that was free when I bought a can of cocoa many years ago. I have never known it to fail to rise into a beautiful cake that is delicious and always moist. My best friend and I used to make it for birthdays when we worked in coronary care years ago and everyone loved it. I received a message from a friend of mine, Kathy Groce, a veteran from The Gulf War and The Irag War where she helped med-vac soldiers and cared for the injured in an Air Force ground base hospital. It is amazing to me the things that we Americans choose to honor. There are heroes among us, men and women willing to do whatever it takes to help others, to protect us all and do what needs to be done quietly and persistently—every day ordinary people we seldom hear about because they aren’t entertainers or politicians. So, I ask you to read about this American hero and let this story sink in deep in your heart and remind you that this is what it means to be an American and a human being. No matter what your race, creed, color, religion or political preferences, this deserves to be read and honored. Michael Jackson dies and it's 24/7 news coverage. A real American hero dies and not a mention of it in the news. You're a 19-year-old kid. You're critically wounded and dying in the jungle in the Ia Drang Valley , 11-14-19 65, LZ X-ray, Vietnam . Your infantry unit is outnumbered 8-1 and the enemy fire is so intense, from 100 or 200 yards away, that your own Infantry Commander has ordered the MediVac helicopters to stop coming in. You're lying there, listening to the enemy machine guns, and you know you're not getting out. Your family is half way around the world, 12,000 miles away and you'll never see them again. As the world starts to fade in and out, you know this is the day. Then, over the machine gun noise, you faintly hear that sound of a helicopter and you look up to see an unarmed Huey, but it doesn't seem real because no Medi-Vac markings are on it. And he drops it in and sits there in the machine gun fire as they load 2 or 3 of you on board. Then he flies you up and out, through the gunfire to the doctors and nurses. And he kept coming back, 13 more times, and took about 30 of you and your buddies out, who would never have gotten out. Medal of Honor Recipient Ed Freeman died on Wednesday, June 25th, 2009, at the age of 80, in Boise , ID. May God rest his soul. Medal of Honor Winner Ed Freeman! Since the media didn't give him the coverage he deserves, send this to every red-blooded American you know. THANKS AGAIN, ED, FOR WHAT YOU DID FOR OUR COUNTRY. Congratulations, you have found the banner for the Twolips Reviews Scavenger Hunt!! 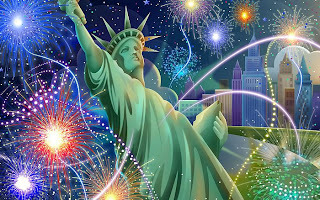 Have a wonderful and safe Fourth of July. I'll be on my deck at sunset watching my neighbors' fireworks as I sip my cool drink and eat my ice cold watermelon. Have fun enjoying our Independence Day!